Summer Classes & Intensives – Stay Strong all Summer Long! Tiny Stars Mommy and Me, Thursday 10:15AM. $105 per class or $275 unlimited summer classes. Refunds are not available, but makeup classes are allowed. NEW! S.W.A.G=Summer with a Groove!! Don’t miss the most amazing week of the summer with guest teachers and master classes in contemporary, street jazz, hip hop, and mush more. Learn from master teachers and get inspired for the dance season! Clinics will be broken into small groups by level. 260 per week of small group technical training. Love to tumble? Live to flip? This camp is for YOU! Perfect those acro skills and learn loads of new tricks and skills! Plus loads of summer FUN! 275 for the week of intensive training including special guest teachers!! Cost is $299 for the week including guest artists. Join us at Kick for one week specialized intensives geared to educate, Motivate and inspire dancers to reach new levels. 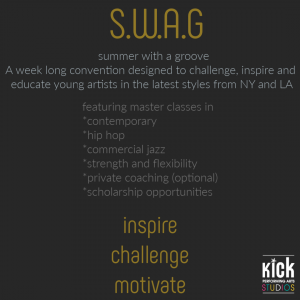 Kick is thrilled to offer one-week intensives for the serious dancer to immerse themselves in a specific style and develop strong technique. 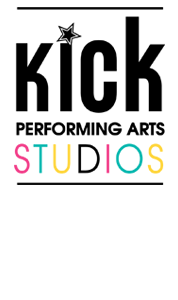 Each Experience will include both Kick faculty as well as Master Instructors from NYC. The program is for experienced dancers ages 6-18, but dancers will be divided by level for optimal technical development . The Experience intensives are perfect for all experienced dancers who wish to really improve their technique. Both current Kick dancers as well as welcome guests are encouraged to challenge themselves in these week-long intensives.